Phantom Universe took my breath away. This book is unique, heart-wrenching, romantic, beautiful, and thought invoking. 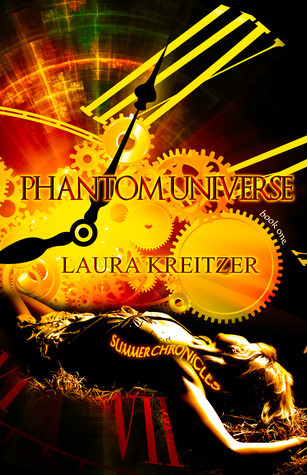 Laura Kreitzer has created an exquisite world, alluring story, and amazing characters. I was completely immersed in the story from page one, and I did not want it to end. Tortured and beaten as a child, Summer became mute, learning that silence was the best policy to avoid the lash of a whip. She was sold to a slave ship at a young age, and her life became dominated by seafarers and the roll of the waves. She is able to find a companion on the ship, Landon, who is able to understand her, and they quickly become best freinds. However, they are wrenched apart when the ship is destroyed, and Summer finds herself stranded on an island. She is unknowingly thrust into a future world, a phantom universe. She meets Gage, who is unlike any other man she has even come across, and he helps introduce her to this new, wondrous realm. Just as Summer is adjusting to her new life, she learns that she is highly sought after, and some Secret Clock Society would love nothing more than to see her dead. When their lives are put on the line, will Summer finally call out? Or will all be lost in the fathomless depth of silence? This book was a completely new type of story for me. I have never read a story where the main character is mute, nor one where slavery and torture is a major underlying theme. The moments when Summer recalls beatings or trauma are packed with raw emotions and pain, and my heart went out to her. Kreitzer does an amazing job bringing Summer’s emotions to life. I cannot remember the last time I have felt this strongly or deeply for a character. However, the thing that I respect the most about this story is how Kreitzer brings awareness to slavery and child trafficking. It is a very real thing, even today, and most of what Summer endured is not far from the truth. If anything, it is a softer version of what some children are forced to deal with. I really like how light was shed on this very real, albeit horrible, problem that we as people face. Hopefully some awareness can be raised, even if it is awareness derived from a fictional story. Ms. Kreitzer, I commend you. People, especially children, should never be exposed to this kind of treatment. I pray some kind of solution can be found soon. Another thing I loved about this story was the emotional connection and depth between the characters. It is just beautiful and refreshing. With the main character being mute, things like emotions and thoughts have to be relayed through something other than words. The understanding between the characters is amazing! Landon and Gage can look at Summer and decipher her thoughts and feelings from just an expression, making the emotional connection and understanding between them astonishingly strong. The fact that a whole conversation could be held where one side basically used gestures and facial expressions and the other party could completely understand is simply brilliant, in my opinion. With articulation, who really knows a person this well? This deep level of understanding is hardly seen in books (or even in real life), and I really enjoyed it. The characters themselves were fantastic. Summer, despite her past, is strong, and even through her moments of weakness, she is resilient. Throughout the book, I got to see her heal and learn to trust others, and I really found myself invested in her story. It was so easy to feel for her and connect to her. Gage is just…swoon. He is a soldier, strong and fierce, and he can deliver orders to subordinates with a cold, commanding voice. However, he becomes gentle and caring around Summer. I love how patient he was with her, and how he showed her it was okay to trust him and open up emotionally. He is romantic and kind, and I loved the chemistry between the two of them. Even the side characters were terrific, and I liked them all, especially Landon. Kreitzer has created a beautiful world and awesome characters in Phantom Universe, and I cannot wait to learn more about them and the Secret Clock Society. (I also am eager to learn more about Julian, who was introduced at the very end of the book. He seems like a very intriguing character! Who is that guy??) I was lucky enough to land an ARC of the second book, Forsaken Harbor, which I am currently getting ready to dive into. If you have not read this book yet, you should definitely give it a try. You will not be disappointed!